THIS RESTAURANT IS CLOSED. 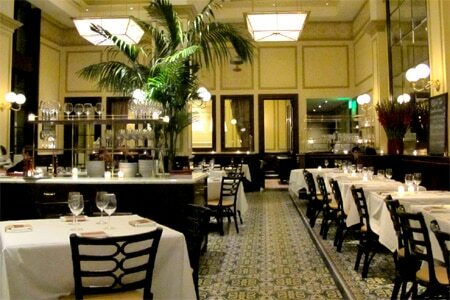 Thomas Keller's famous brasserie in the heart of Beverly Hills. Thomas Keller was GAYOT's 2013 Best Restaurateur in the U.S. THE STORY BEHIND BOUCHON BEVERLY HILLS CLOSING: When you have become one of the best chefs in America (and, arguably, in the world), when you open a new restaurant it has to live up to the chef's reputation. Even though Bouchon Beverly Hills would not be serving haute gastronomy like sister restaurants The French Laundry and Per Se, it still had to be a beautiful venue. After delays, Thomas Keller finally cut the ribbon on November 16, 2009, during a star-studded soirée. Designed by famous designer Adam Tihany, the restaurant really makes you feel like you are in a Parisian brasserie: a circular zinc bar, shellfish display, the very particular floor tiles, French quotes on the walls. If you have the chance to get a tour of the kitchen, you will understand how detailed and precise Keller is. Each group of items has its own walk-in fridge: one for dairy, one for fish, one for meat, one for vegetables. The bakery is the size of most restaurant kitchens. (The same goes for the pastry area.) Basically, the kitchen is bigger than the dining room and bar. In one word: impressive. Despite all these investments, hard work and efforts, Bouchon Beverly Hills, Bouchon Bakery and Bar Bouchon will be closing their doors at the end of 2017. “Sad it is. We can only say that we hope to see all of our friends and supporters until the end. It's been a wonderful 9 years. We will persevere and become stronger because of it. Success is a series of accomplishments fueled by the lessons of failure.” says Keller. We agree with him. It seems that the owner of the building and the tenant did not agree when the renewal of the lease came up. What is going to happen to the charming hand-painted drawings from artist Paulin Paris that adorn the walls? We may never know. But we do know that this is a sad culinary moment. View our exclusive video with chef Thomas Keller. Likes: The grand brasserie décor. The service. Dislikes: If you are not able to get a tour of the impressive kitchen. About the food: The entire gamut of brasserie fare appears on the menu: seafood platters, leg of lamb, steak frites, roasted chicken, boudin noir sausages, bouchot mussels, charcuterie, Bibb lettuce with garden herbs, quiches (during lunch), croque madame; they are all here (except the choucroute), generously served by an expert hand. And since we are in America, you will find a huge beef burger on a brioche bun. Desserts follow the same classic path, with profiteroles and crème brûlée. 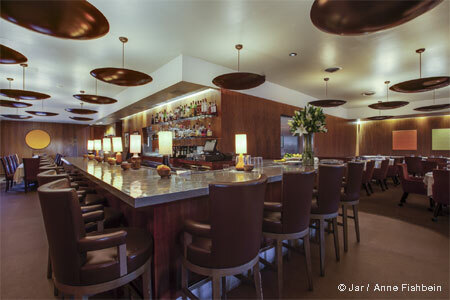 About the drinks: The wine list focuses on offerings from France and California. Classic cocktails, such as the Blood and Sand, are also available.